Who doesn’t love the classic flavor of malt? 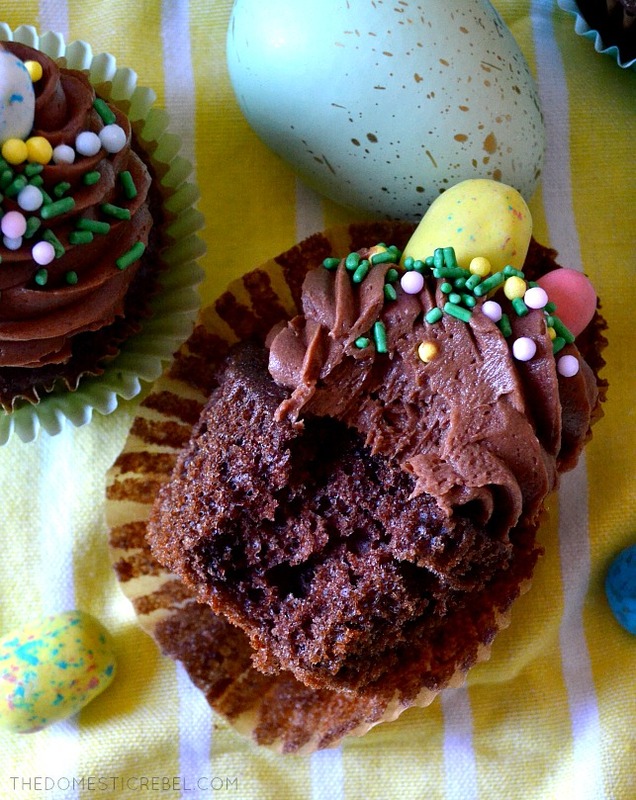 These Chocolate Malt Cupcakes are extra festive with malted Easter egg candies, but when it isn’t Easter, top them with classic malt-ball candies! I cannot believe Easter is right around the freakin’ corner! I feel like I just celebrated my birthday (January 24)… and now we’re in full-fledged springtime? What happened? However, I have to admit – although my allergies will not agree, spring is such a lovely season, especially when the stores bust out the Easter decorations and candies. Is it just me, or does Easter candy taste the best? There’s something about the pastel colors that really tastes better to me. Same with the white Circus Animal Cookies… they taste better! I cannot explain it. So when I saw the speckled Easter malted eggs, you know I had to get them! (Along with the Reese’s crunchy eggs and jelly beans… and about 752 other things I also did not need from Target). Then I realized I’ve never done a malt recipe and it was high time that changed ASAP. So here we are! 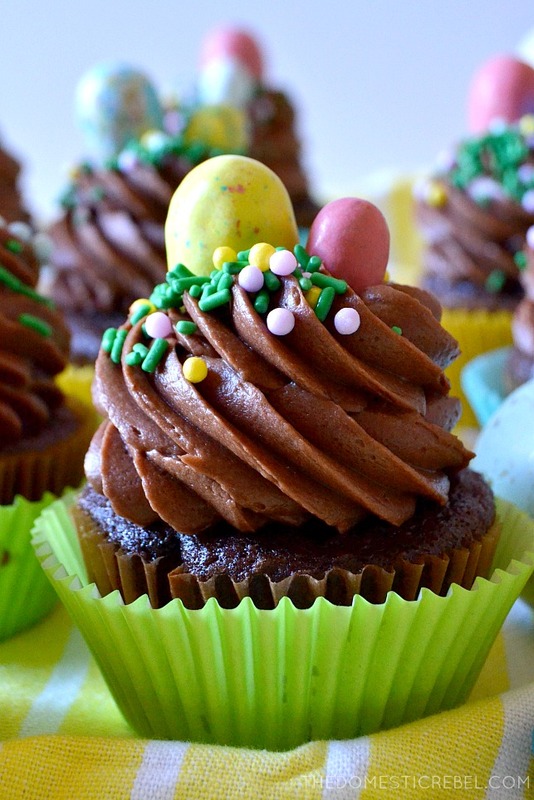 These Chocolate Malt Cupcakes are spectacular. Super moist and fudgy cake with a chocolate malt frosting that’s to-die for. It totally reminds me of sock hops and diners from the 1950’s with that classic, quintessential soda fountain flavor of malt. (Never mind that my parents weren’t even born in the 50s, yet somehow I know I’m right. I’ve seen Grease. I consider myself an expert in 1950s nostalgia). 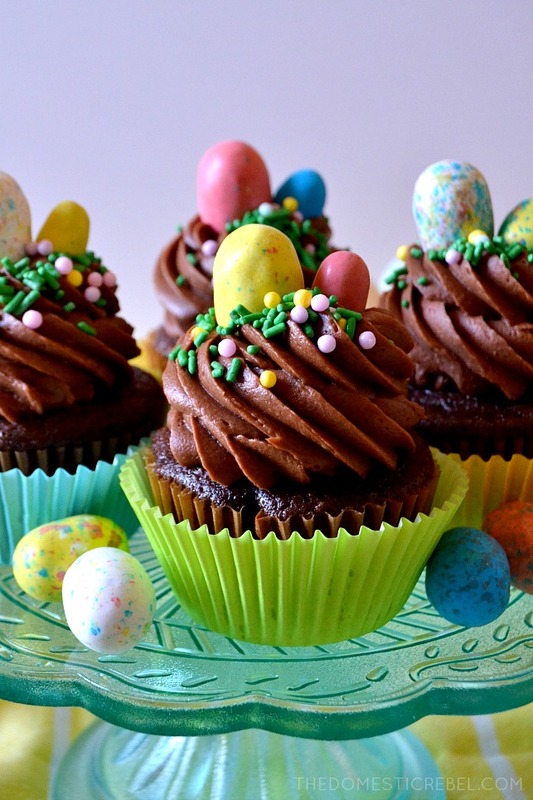 While these are totally Easter-and-springtime-centered, feel free to top these cupcakes with Whoppers malt-ball candies throughout the rest of the year. 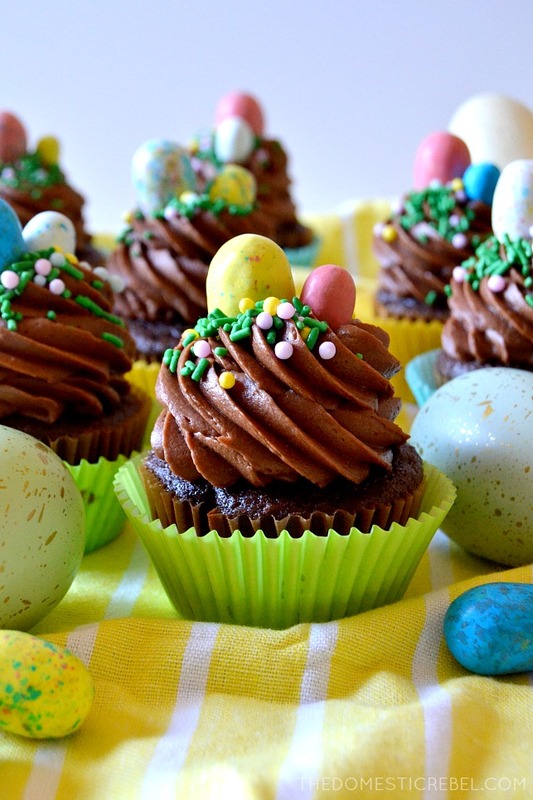 I just love the bright color and fun freckled look of the malted Easter eggs! These Chocolate Malt Cupcakes are super flavorful, easy, and fun, with that classic diner malt flavor! Preheat oven to 350 degrees F. Line 2 muffin tins with about 18-20 paper liners; set aside. 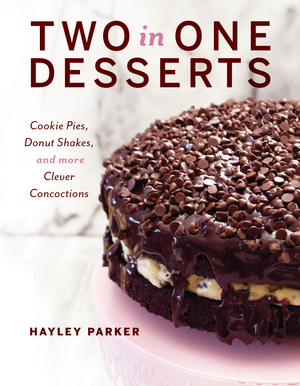 In a large bowl, combine the cake mix, buttermilk, oil, eggs, malt powder, and chocolate pudding powder with an electric mixer until combined and smooth, 2 minutes. Portion the batter evenly among the muffin tins, filling about ¾ full. Bake for 16-18 minutes or until a toothpick inserted near the center comes out clean. Cool completely. In the bowl of a stand mixer, cream together the softened butter, vanilla, malted milk powder, and cocoa powder until smooth, 1 minute. Gradually add in the powdered sugar, beating well after each addition and alternating with the heavy whipping cream if frosting gets too thick and paste-like. Frosting is finished when it is light and fluffy. 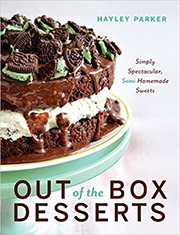 Pipe or spread the frosting onto the cooled cupcakes. 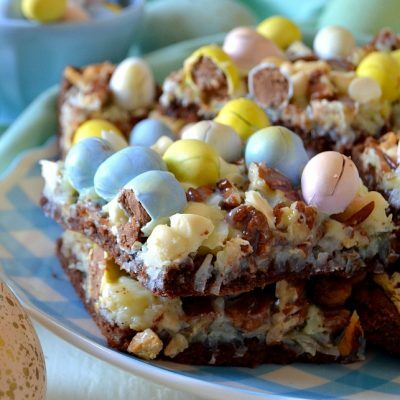 Immediately garnish with sprinkles and malted Easter eggs or malt ball candies. 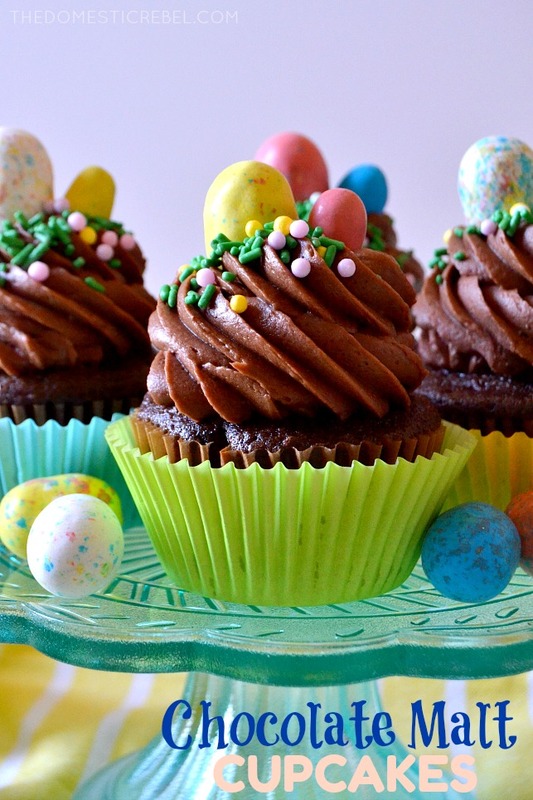 Fudgy, moist, delicious chocolate malt cupcakes with an amazing malt buttercream! Perfect for any time of year!